On Thursday, 1 November 2018, Al Mezan Center for Human Rights sent a legal notice to the Palestinian Council of Ministers and the Social Security Corporation in which it demanded amending Law No. 19 of 2016 on Social Security to be more compliant with international human rights standards. In the legal notice, Al Mezan stressed the importance of regulating and delivering social security as a basis of protection enshrined among other basic rights in the Universal Declaration of Human Rights and other international conventions. Pursuant to Palestine’s full subscription to several human rights conventions, legislative and policy actors are now obligated to fulfil the provisions of these conventions, primarily the International Covenant on Economic, Social and Cultural Rights (ICESC). Enacted in Palestine since 2 July 2014, ICESC mandates in Article 9 that “the States Parties to the present Covenant recognize the right of everyone to social security, including social insurance.” Under its obligations, Palestinian authorities are obligated to issue laws guaranteeing social justice and social protection as well as the human right to work and the conditions associated therewith. The current law, No. 19 of 2016, has been rejected by community-based organizations, work unions, and syndicates that have stressed its failure to ensure social security and social justice, especially as it was not presented for public discussion beforehand. These actors stated that the Law was not informed by international regulatory principles on social security, in particular the principle of comprehensive coverage. The Law also deviated from the provisions of the International Labor Organization’s Convention No. 102 on Social Security (Minimum Standards) of 1952. 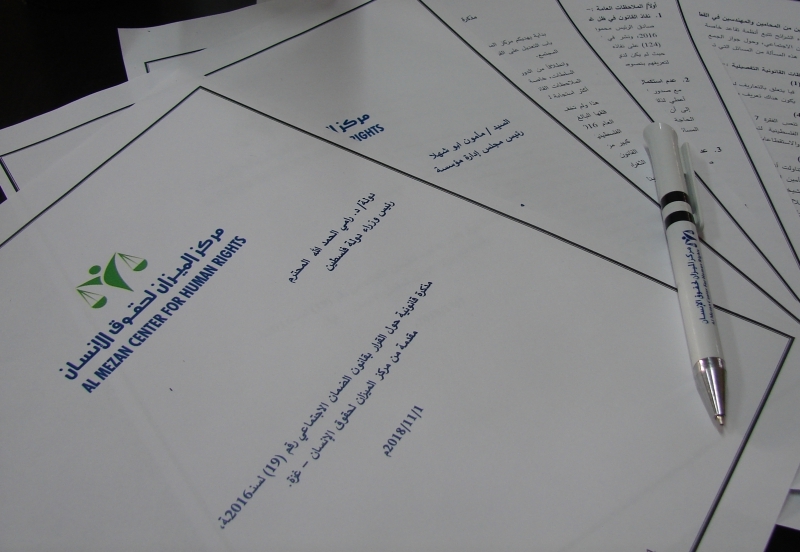 Seeking to promote the rule of law, separation of powers, and protection and promotion of human rights in the occupied Palestinian territory, Al Mezan has prepared this legal notice to bring to the attention of lawmakers the need to amend it, to become more protective of people’s rights and more compliant with international human rights standards.